Your feet are vital to quality of life – trust them to our experts. We go the distance in bringing specialized foot care to our Central Texas patients. The difference is night and day – we’re redefining podiatric excellence. You’re on your feet all day. That means that they’re prone to a variety of types of injuries. Get to know how we can help you get the treatment you need by exploring our practice areas. Life brings a variety of challenges for the young and the more mature, but foot and ankle pain shouldn’t be among them, especially with the experts at Austin Foot and Ankle Specialists just around the corner. Focus your time and energy on the people and activities you love, and leave your foot care to us. Whether you have suffered a sports injury or you are considering foot or ankle surgery, Dr. Craig H. Thomajan DPM, FACFAS, FAENS and Dr. Ricardo Chica DPM will help you resolve your foot condition so you can step confidently into your next big adventure. Check now for available appointments. Has foot and ankle pain put an end to your favorite activities? Don’t miss another opportunity to enjoy the things you love. Find the specialized help that your feet deserve. Podiatrists are foot specialists who have spent years studying and preparing to care for your unique feet. Click on the image to the right to view our Interactive Map of the Foot. The complex structure of bones, tendons, ligaments, joints, and muscles that comprise the feet and ankles takes dedication to master. That’s why you can feel confident in the care you’ll receive from our physicians. Each doctor has specialized training in foot surgery, so if conservative measures fail, you can continue your care without transition or interruption. Our practice has redefined podiatric care with state-of-the-art facilities, a focus on quality patient relationships, a commitment to conservative treatments, and exceptionally trained surgeons. Your feet deserve the best, and you’ll find it here! Your feet are unique. From their shape to the way that they function, your foot care is as individual as you are. We take the time to ensure a thorough evaluation and diagnosis prior to explaining your treatment options. Education is key to great health care decisions, and our staff will take the time to answer your questions before you choose the best option for your foundation. While some treatment methods involve effective, old school techniques, we also believe in bringing innovation into the world of podiatric medicine. Platelet Rich Plasma Therapy, EPAT, MLS laser therapy, laser therapy for nail fungus, on-site physical therapy, and on-site surgical facilities are just some of the ways that we’re combining excellence in podiatry with new treatment methods and state-of-the-art technology. Does each day start with foot and ankle pain? If so, it’s time to make a change. From heel pain to foot deformities such as hammertoes and bunions, we can help you take a step toward pain-free feet today. Don't hesitate - schedule your appointment online. The Three Lakes Physical Therapy and Wellness Center is located on-site, so you’ll have access to everything you need in one convenient location. An expert, friendly staff and high-quality care await you from full body certified and foot and ankle focused physical therapists at our 5000 Bee Cave Road, Suite 200, TX office. Do You Have Lingering Pain? Austin Foot and Ankle Specialists invites patients to sign up for a free, informative resource to learn more about getting relief from lingering nerve pain. Heel pain is very common, but often untreated. 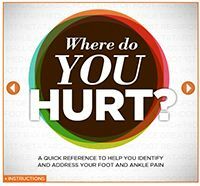 This is a guidebook to understanding heel pain - it's causes and treatments. Dr. Craig H. Thomajan of Austin Foot and Ankle Specialists offers a complimentary book to help those suffering with nerve pain manage the condition. Dr. Craig Thomajan DPM, FACFAS, FAENS of Austin Foot and Ankle Specialists offers a free book to provide information on how to keep your feet from hurting. The experts at Austin Foot and Ankle Specialists provide a free book on how to prevent injuries so you can keep running and not interrupt training. Diabetes and Your Feet: Free Advice! Dr. Craig H. Thomajan, of Austin Foot and Ankle Specialists in Texas provides an excellent resource for those dealing with diabetes, and it’s free!